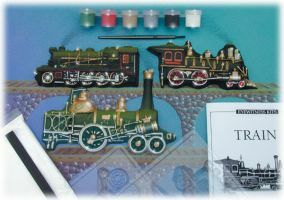 This Earthworks Kit, "TRAINS", draw everyone in to the fascinating world of steam engines - almost as if we were there! Learn about how the steam locomotive was vital to the US in the glory days of the railroads, and how it helped our country become as great as it is today! Then cast three of the most famous steam engines made back in the day, in superbly intricate detail. Take a look at PerfectCast, the ideal accessory for any casting kit - more casting material!